Touched by fire : the life, death, and mythic afterlife of George Armstrong Custer · One Book. One Author. One Hour. Notes on front endpaper: Custerphiles p. 404. Custerphobe. Steve Ambrose on Libbie "nonsense" p. 408. Why Autie. Ohio/Michigan a Democratic family. West Point-last in his class of 34--graduated 1861. Custer's court martial. Libbie's book-Tenting on the Plains. Custer's book-what was it. 23 yr. old youngest general. Civil War-every battle from Bull Run to Appomattox. What Washington like during the C.W. p. 43. Lincoln. Libbie 12 years of marriage, 57 yr. widowhood. "They died with Boots on" 1947 movie p. 51. His dress-a circus rider gone mad p. 55. After CW--Louisiana and Kansas 7th Calvary, Lt. Colonel. The executions of Lancaster p. 67. The march from Louisiana to Texas--He was hated p. 73. Enlisted men 67-91; vermin infested barracks p. 77. The Court Martial of 1867. [verso] Crazy Horse--surrendered 1877; Sitting Bull. Notes on front fly sheet: Custer Haters--who were they. Monuments--West Point, Monroe, Michigan, New Rumley, Ohio. The whys of Custer's Last Stand p. 334. Scatting/skulking/sneaked. Persistence of racism--p. 345. Reason for ongoing notoriety of Big Horn. Notes on verso of half-title page: Redpath Lecture Bureau $200 a performance he was a gambler, horses, deals. Underlinings/Notes: Underlinings: background/composition of Custer family, education/career, role models, Libbie's background, description, appeal, courtship/marriage/devotion, clothing, war, Indians. Notes: "Hero or non-hero," "cried when leaving mother," "not history but myth," "12 yr. marriage," "50th anniversary," "she was 34 when he was killed," "'Libbie' she lived to be 91--having devoted 57 years of widowhood to Custer," "5 other children," "Tilden," "Autie," "age 13 Monroe, MI," "1855 Hopedale, Ohio," "class notebook," "West Point," "dummy, civilian clothes," "demerits [. . .] Custer had 52," "court-martialed," "lost her mother at 12," "her teacher," "Nov. 1862 not impressed," "Libbie became fearful," "Civil War opponents," "a captain," "lead charges, energy never flagged," "drinking, 'the pledge'," 23 yrs old a general," "Custer wanted attention," "Full circle--Beginning Bull Run, End-Appomattox," "Libbie in camp," "dim cowards," "Libbie only woman in camp," "Libbie's letters captured," "Fannie Fifield," "WASH was dirty," "Vice President's letter," "1864, sufferers, Gomorrah," "Lincoln," "Richmond, Jeff Davis' house," "McLean's House at Appomattox writing table given to Libbie," "In Stanton's office," "enemy soldier given back to wife," "play Dixie," "feared battle causalities," "LeRoy Elbert," "Custer's dress," "circus rider gone mad," "at end of Civil W 25," "Ft. Leavenworth," "great stress," "post C.W.," "controversial," "mustered out 1865," "Kansas," "Lancaster sentenced to execution," "men became bitter," "men treated badly," "McQueen," "a bad commander," "letter to Grant," "1/3rd in Army deserted 67-91," "Custer didn't drink but gambled,""Indian massacre," "wives=domestic matters," "Charley," "Crazy Horse, Sitting Bull," "obsessed with Libbie," "Thomas Weir affection for Libbie," "July 21 Custer arrested AWOL," "found guilty, suspension 1 year 28 yrs. old," "1876--40 mil., 38 states," "Bell exhibit," "Sec. of war Belknap," "testimony," "star witness," "Grant's brother," "Custer arrested," "gambling, race horses, $13,000 liabilities," "Little Big Horn, the Cause," "Sioux, the Black Hills," "scalps," "1875 gold," "1.5 billion in gold," "secret conf-The White House Nov. 3, 1875 order to Indians in dead of winter. Sioux who lived outside system--Sitting Bull, Crazy Horse," "May 17, 1876 Gens Crook & Terry," "350 men," "5 reporters," "no alcohol, tea, coffee," "Indian allies," "water alkaline, no coffee," "Indians resting," "Custer attacks village," "14 bullets for every man killed," "Spencer rifle," "Indians account accurate," "Sitting Bull," "Custer's groin, Tom Custer, Boston," "7-10,000 hostile Indians," "1500 warriors," "had to attack," "other battles," "tells Libbie, the cloak, Custer's [i.e. Yates'] son," "Libbie poem," "Major Reno and women," "peeping Tom," "Reno dishon. discharge Army,""Benteen hated Custer," "omitted court martial," "kickbacks," "Benteen's court-martial, guilty," "Indians and the buffalo," "Sitting Bull July 20, 1881," "Vrow Foot executed," "former slaves," "Crazy Horse," "Comanche [. . .] dies at 29," "Reagan" "JFK," "General Sheridan," "the Whys of Custer," "Libbie--whites 25-1," "racial superiority," "whites wouldn't listen to Indians," "racism," "Custer antihero," "Custer today--blunderer, foolish inept architect of his own ruin," "3 books," "lectures fees," "stage fright," "cries at sight of veteran," "Indians right," "Custer buried at West Point [. . .]Custer statue at West Point," "Libbie and the statue," "statue is removed," "Monroe statue removed," "Tenting on the Plains," "Libbie writes of old age," "died April 6, 1933," "will, gave money to decedents," "2 regrets," "myth of the battle," "Custer's body not scalped," "Tom Custer mutations," "Custer's image," "Anheuser Busch," "myth," "lost 5 members of his family," "letter from Libbie to Cleveland," "view of battlefield," "not important historical figure," "passion," " Custer buffs," "fist fight," "Libbie everyone's favorite," "Ambrose "nonsense," "she made money off of Custer's image," "Libbie in London," "India," "Custer's talent was narrow," "soldiers inferior. " 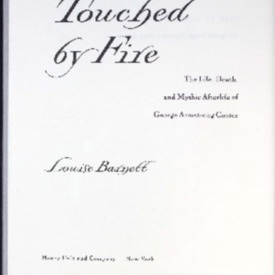 Barnett, Louise K, “Touched by fire : the life, death, and mythic afterlife of George Armstrong Custer,” One Book. One Author. One Hour., accessed April 21, 2019, http://booknotes.gmu.edu/items/show/346. For more than a century, Americans have been captivated by the legend of General George Armstrong Custer. Since the end of the long afternoon of June 25, 1876, when his small band of 267 men faced some 3,000 Sioux and Cheyenne warriors in a remote corner of Montana, Custer has held a place in the pantheon of America's great figures, and the Last Stand has endured as one of the primary images of American expansion into the western frontier.Alternately invoked as the personification of absolute folly and pure bravery, Custer resonates in our national imagination yet eludes simple definition - each generation recasts the man and his death according to its need for a particular vision of America.Touched by Fire undertakes the search for, as one historian put it, "a man waiting to be discovered" between the extremes of his experience. Renowned for his love of pranks at West Point, where he graduated last in his class, Custer had a flair for heroic achievement that brought him phenomenal glory in the Civil War as one of the Union's youngest generals, but left him mostly frustrated on the lonely plains.Author Louise Barnett traces all the complexities of this erratic personality, fully incorporating into her account his wife, Elizabeth Bacon Custer - "Libbie" - whose unusual spousal devotion endured through fifty-seven years of widowhood.Bringing a new racial perspective to Custer's legend and including new material that surfaced in archaeological excavations of the battlefields in the 1980s, Barnett attempts to understand how a man famed for brilliant military performance came to wage an impossible attack near a small stream called the Little Bighorn. Beyond the transfixing moment of the Last Stand, Barnett shows us another Custer who equally seizes the imagination. "Custer, George A. (George Armstrong), 1839-1876."